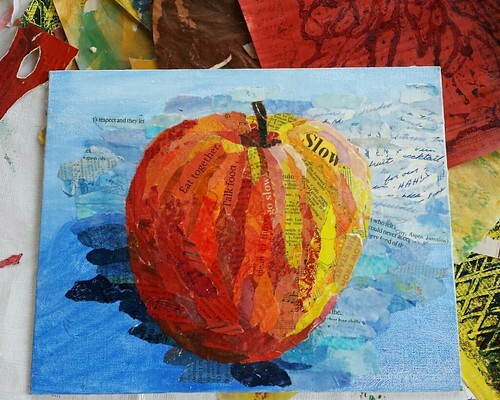 I’ve just returned from a new-to-me art retreat, Art Makers Denver, where I took a paper painting collage class from Elizabeth St. Hilaire. I’ve been following her work online for a while and since I like to visit my family near Denver in September I jumped at the chance to combine that trip with this retreat this year. The retreat was smaller than most of the ones that I’ve attended elsewhere, which made for smaller classes and more attention (if you like more attention). I had a big table all to myself, which was great since I tend to push into other people’s spaces. 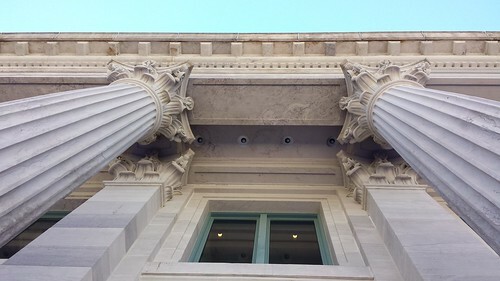 The venue was the recently renovated McNicols Building in Civic Center Park, a spacious and light-filled place. Delicious lunches were provided on two days and on the third day we were each given a $10 voucher to use at the food truck festival in the park outside. We got lots of extra goodies such as locally made sodas and juice drinks, healthy snacks, a copy of Uppercase magazine, and various arty thingies. 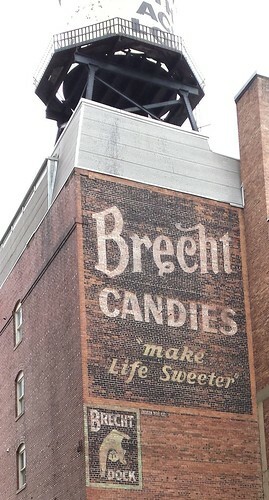 I was really looking forward to taking one of Leighanna Light‘s book classes because she is, well, AWESOME, and because I learned so much about connecting found objects and working with metal in the class I took from her a few years ago, but her classes were canceled. I looked for Helen Hiebert, who is huge in the papermaking world and I simply wanted to meet her, but her classes didn’t make either. So hopefully this retreat will become more popular as it matures and more people learn about it. 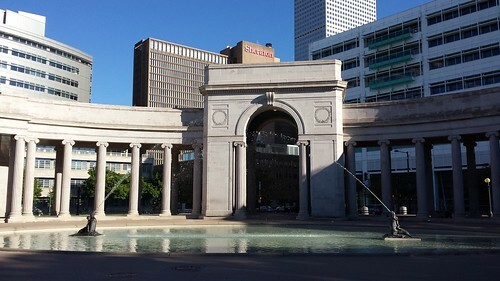 One other note before I get on to the other photos…this was the first time that I took the bus round trip from Westminster, a suburb of Denver, to downtown. It was an easy, clean, flawless experience. I heard good things about Denver’s new light rail system too. 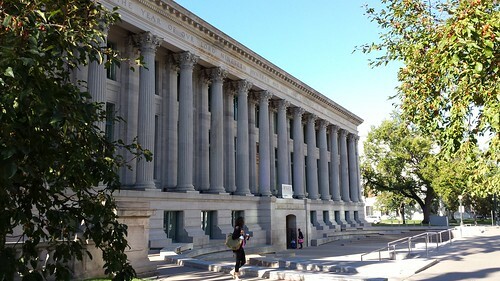 Although the train trip to the airport is a bit pricey, it still beats the price of a taxi or renting a car, and costs less than paying for parking downtown. ^^^Since Leighanna’s class was canceled on Sunday, I spent an extra day painting and printing papers in Elizabeth’s class. I didn’t mind, because I love doing this. I went as fast as I could without overthinking. The only things I kept in mind were the colors I might need for the collage and layers. Lots of layers. 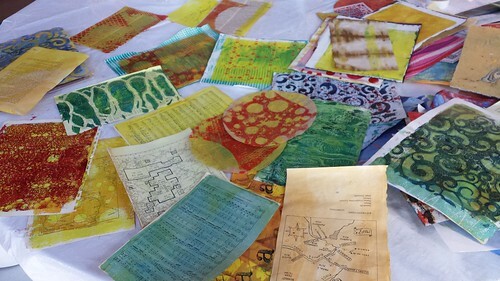 I used old book pages, dictionary pages, sheet music, map pages from a book about Colorado mining towns, washed and dried coffee filters, handmade papers, and the backs of some of the papers I painted and printed in Albie Smith’s class at An Artful Journey in 2011. 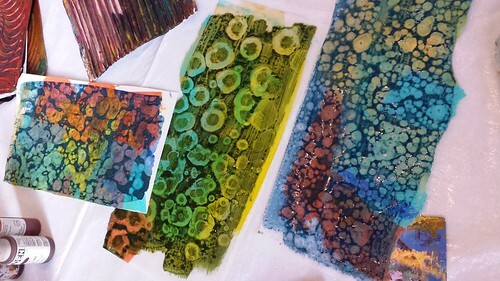 ^^^Some of Elizabeth’s demonstration papers using alcohol droppers and spritzing with liquid dish soap on top of wet paint. 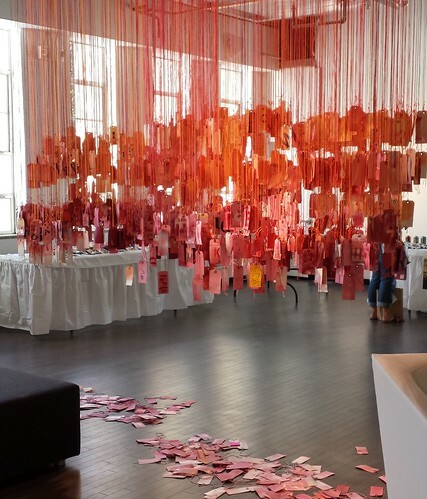 ^^^Beautiful art installation to which the attendees were asked to decorate a tag and hang. 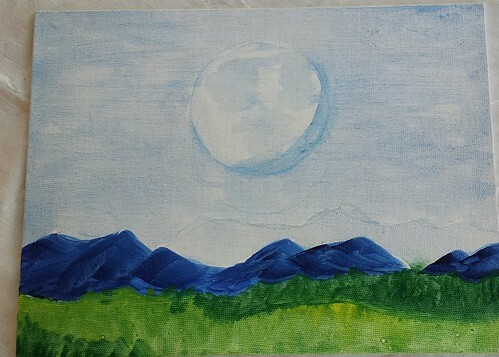 ^^^Because the nearly full moon was huge over the weekend and I could still see it hanging over the mountains each morning, I hoped to do this painting as a collage after my apple. But time ran out. I’ll do it here in North Carolina. 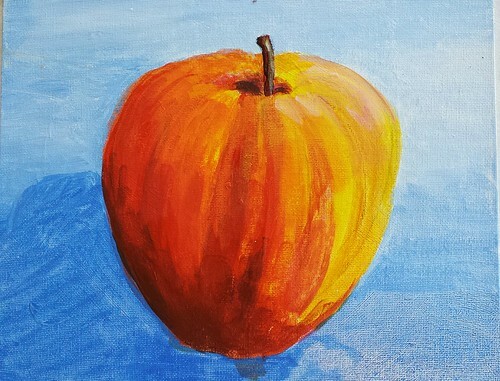 ^^^Everyone in class painted an apple before class in acrylic on a firm surface such as a canvas covered mat board or wooden panel. Elizabeth wanted us to work with a simple shape where we would learn about light and shadow. 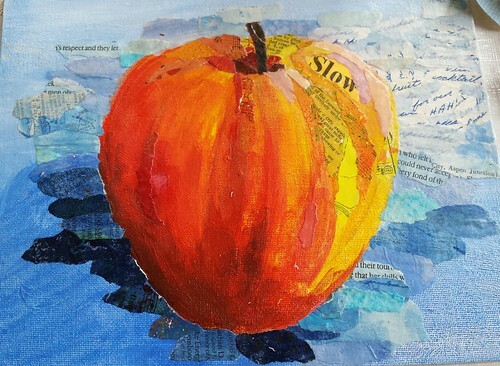 I’ll work a little more on my background, but my apple is done. Even though two people told me they thought it was a pumpkin.